Once again this year, RIMSD #41 is partnering with the rest of the Quad Cities school districts and the United Way of the Quad Cities to focus on attendance in the schools and have fewer absences overall in the school district. 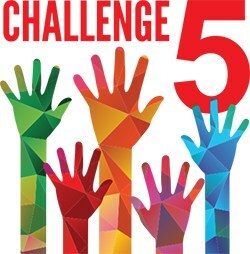 Challenge 5 Day will be held on Thursday, September 13, 2018! What does this mean? It means that Thursday, September 13 is THE day that we want to get as close to 100% attendance in RIMSD #41 as possible! Promotional materials will be sent along to schools the week of August 27. The United Way of the Quad Cities will be providing a special prize to students who attend school on that day. WHY "Strive for Less than 5?" Because fewer than 5 absences help to keep kids on track during the school year. Missing a day, is missing a day. Your child has a right to 180 days per year. Missing just two days a month or 18 days a year makes your child chronically absent and putting them at risk. Eight in ten chronically absent kindergarten and 1st grader students will not read at grade level by the end of 3rd grade. Three of four 6th grade students who are chronically absent will not graduate high school. Keep kids in school and help give them the future they deserve. Set up a regular bedtime. Prep clothes and backpacks the night before. Only keep children home if they are truly sick. Have a back-up plan for getting to school. Avoid scheduling doctor’s appointments and trips during school hours.